Introduction. The Need for an IPSE. System Concept and Architecture. Demonstrating ASPECT. The Information Base Engine. The Information Base Superstructure. HCI Perspectives. Constructs for Interface Generation and Management. Doubleview--A User Interface Design Tool. Programming and Debugging Distributed Target Systems. A Comparison of ASPECT with Other IPSEs. References. List of Contributors. Index. A major part of software engineering developments involve the use of computing tools which facilitate the management, maintenance, security, and building of long-scale software engineer projects. Consequently, there have been a proliferation of CASE tools and IPSES. 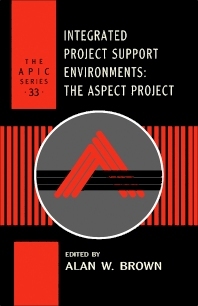 This book looks at IPSES in general and the ASPECT project in particular, providing design and implementation details, as well as locating ASPECT in IPSE developments. Software, IPSE and CASE engineers and project managers as well as researchers and advanced undergraduate students studying sofware engineering.